Sometimes, you simply want the best. Your writing time is tremendously valuable. Whether you're working on your next novel or jotting down travel memories your great-grandchildren will someday treasure, you want a journal that will last -- and that will make you want to write. These rare Italian journals are amazing. Do you keep a lab notebook? A programmer's notebook? Do you take notes at business meetings and conferences? If you do, one of these Italian notebooks will bring you months of joy and satisfaction -- and for the rest of your career they'll add beauty and distinction on your desk or on your shelf. These are the very best journals we can find. 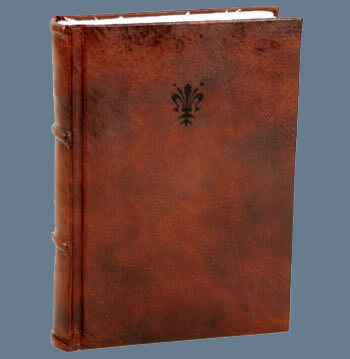 They come from a workshop in Florence, where each journal is carefully bound in superb Italian leather. The traditional binding will last a very, very long time. These large 8x10 journals have 300 pages of rich, cream-colored, hand-cut Italian paper. So does the new Traveller's Journal, which is 6x8 and so is a little easier to handle in trains and planes and when writing in restaurants. Each journal is filled with wonderful paper -- a joy for fountain pens and even for watercolor.